Is a “$46 TRILLION” Lehman Brothers Event Just Around the Corner? The financial world is abuzz with talk of the first Presidential debate. Meanwhile, one of the largest derivatives books in the world is imploding. 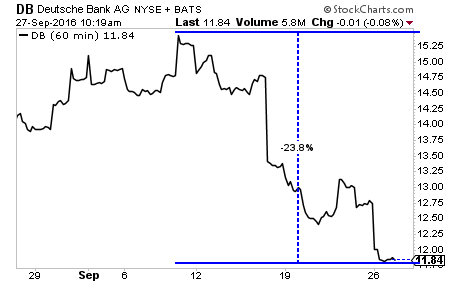 Deutsche Bank (DB) is the 11th largest bank in the world. And it has over $61 TRILLION (with a “T”) in derivatives on its books. AND IT HAS LOST NEARLY A QUARTER OF ITS VALUE IN THE LAST THREE WEEKS. DB is not alone here. Across the board, we’re getting signs of an impending banking crisis in Eurpoe. 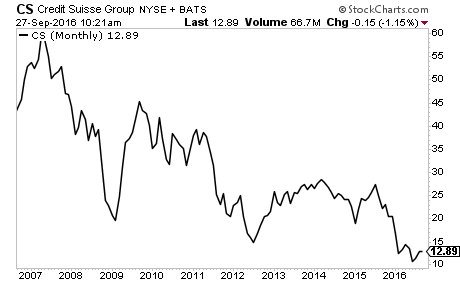 Credit Suisse (CS) is trading BELOW its 2012 banking crisis lows. The EU banking system is $46 TRILLION in size. This is THREE TIMES larger than the US banking system, which nearly imploded the markets in 2008. And the EU as a whole is leveraged at 26 to 1. 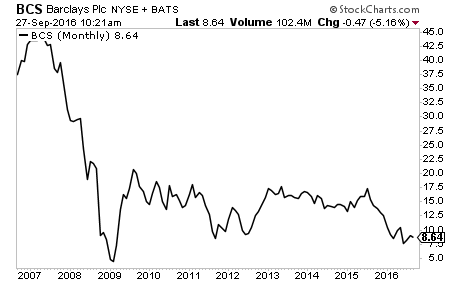 Lehman Brothers was leveraged only slightly higher than this at 30 to 1. We believe the global markets are on the verge of another Crisis. 2008 was Round 1. This next round, Round 2, will be even worse. If you’ve yet to take action to prepare for this, we offer a FREE investment report called the Financial Crisis “Round Two” Survival Guide that outlines simple, easy to follow strategies you can use to not only protect your portfolio from it, but actually produce profits. We made 1,000 copies available for FREE the general public. As we write this, there are less than 100 left.